In China, reishi mushrooms have earned the nickname, “The Mushrooms of Immortality,” and if their longstanding reputation is any indication, this nickname could be appropriate for a few different reasons. Some archaeological evidence points to reishi mushrooms having been used as far back as 7,000 years ago, and with good reason. The benefits of these mushrooms aren’t only applicable to diseases and conditions that existed thousands of years ago, but to those that plague mankind today as well. Reishi mushrooms are known for their red, oblong-shaped caps and tough texture and woody flavor. Unlike other conventional mushrooms, however, they aren’t the tastiest things to put on a salad or in a stir-fry, and instead modern man is most likely to reap their benefits from extracts. It’s these reishi mushroom extracts that have been used in a variety of scientific studies. These studies have linked the mushrooms to reduced blood pressure, weight loss, improved nervous system function, and even the treatment and prevention of cancer and diabetes—two top modern health concerns. Researchers with Bellarmine University found polysaccharides and saponins in reishi mushrooms that are able to reduce cell proliferation (or multiplying) in cancerous lungs. This is because the mushrooms compounds trigger apoptosis or cell death, essentially targeting cancerous cells and ensuring their demise. Another study, from the MARA Institute of Technology in Malaysia, found that reishi extract was able to boost the immune system—making it better able to fight cancer. They also found that reishi could assist in reducing the side effects of conventional cancer treatments, like radiation and chemotherapy. Though the researchers admitted the results varied depending on the type of cancer, they recommended taking six 500 mg capsules of extract each day to assist in cancer treatment. In diabetes research, reishi mushrooms have been found to lower blood sugar in lab animals. 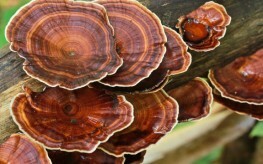 Reishi extract was able to lower blood glucose levels of mice within only a week of treatment. A study from Peking University in Beijing found that reishi mushrooms could protect the kidneys from stress caused by diabetes, potentially even stopping kidney complications. These mushrooms have survived as a natural medicine for thousands of years, and it isn’t by pure coincidence. Traditional Chinese Medicine (TCM) is at the foundation of modern natural medicine, and reishi mushrooms have earned their place in both. Brought to you by the same gullible morons who wiped the Western Black Rhino from the face of the Earth. Awesome. Last time I had a “conversation” with this guy he was spouting utter nonsense and doing it loudly and aggressively although he had NO IDEA what he was talking about. it takes all kinds to make up this earth. thanks.